I got a king of cups reversed in my daily tarot draw one yesterday (the 20th). Is this possibly referring to my coworker who has been showing odd behaviors towards me and giving me the heebie jeebies? I've only once had that gut feeling about anyone else, and I've traveled to different countries such as Germany and China. The previous time I had that gut feeling, I had gotten off a bus in Germany and some guy from some other country started following me. I was a high school exchange student my senior year. He was older. He tried talking to me and I said my German wasn't very good. He started talking to me in English, and it was obvious that he was hitting on me. I lied, said I had a husband waiting for me, discretely put a cheap ring that I had on that finger to show him, and very nearly ran all the way to the place where I was staying. Seriously, that is the only time I ever had that gut reaction before. I am sorry but we no longer help with interpretations on the forum. Many times, you'll just have to watch the daily events that happen to you and then realized what Spirit of the Tarot was telling you. That's what I like about a daily pull. Greetings everyone. First off I want to thank everyone for their help with my posting. The situation has resolved, my father has selected from his fiancé and they are on good terms. Now for my question: I am a fairly good tarot reader and am wanting your insight on what cards you feel /use for certain spiritual conditions. What card/cards to you means being afflicted by the evil eye? Or money crossings, ancestor contact, etc. I've been developing my own associations and would love any information anyone could offer so that I may better help myself an others that I am reading for. Thank you all, many blessings. You say you are a good tarot reader, yet your query is a beginner's question, so, at the risk of inadvertently offending you, i am going to reply as if you were a beginner, in the hope that my answer will be of use to others who read this forum in years to come. No offense is intended, and i am not questioning your innate gifts or previous training. I recommend two approaches here. You may like the first approach, as it involves only a small expenditure of money and time. You will NOT like the second approach. No one does, because it involves time and money. 1) To understand how meaningful associations have developed for the various cards over time, you will will need to undertake some study. "Intuitive" or idiosyncratic meanings for the cards prove unsatisfactory in the end, because clients who regularly purchase readings are well aware of the general meanings of the cards and will fault you for misinterpretations if you range too far afield from the normative meanings and symbols. • If you do not already own it, buy a copy of "The Pictorial Key to the Tarot" by Arthur Edward Waite. It is cheap, in print, and we stock it in our shop. It will guide you as no other cheap, short, expert book has ever done. • Also pick up a copy of "Classic Tarot Spreads" by Sandor Konraad. This book describes a number of layouts suitable to short or long readings, and layouts which will set your work apart from other readers if you work pychic fairs or in a metaphysical shop with other readers. • If you intend to use your cards in spell-casting as well as for divination, you will also want a copy of the book "A Deck of Spells" by Professor Charles Porterfield. There are 13 different spells made with tarot cards in the book, as well as help in adapting both tarot cards and Lenormand cards to the 100 or so old-fashioned and historical spells that use playing cards as part of their construction. We carry all of these books in the Lucky Mojo Curio Co. book department, and Lucky Mojo is the publisher of Professor Porterfield's works. • An assortment of readings with various card decks, including tarot cards, playing cards, Lenormand cards, and oracle cards. • An assortment of email readings, in-person readings, phone readings, skype readings, radio-show readings, and youtube readings. • An assortment of free mini-readings, as offered on radio shows; some traded readings with other learners and students; short, cheap ten-minute readings; standard mid-ranged half-hour readings; and long, costly one-hour readings. • An assortment of "general" readings, "life" readings, " "birthday special" or "year" readings, and specific question-answering readings. • An assortment of layouts, including the three-card cut, three-card spread, Celtic cross, horseshoe, grand tableaux, tic-tac-toe, wheel of the year, and other forms. You may return to a reader several times if you wish, or choose a new reader with each session. The time taken to complete this program will range from two to four years, and the cost to you will range from $1,000.00 to $6,000.00 (you can reasonably expect to pay around $4,000.00) over those years, for an average of around $85.00 per month if you do the work in four years, or $170.00 per month if you do the work in two years and "graduate" more quickly. You will then know how to read any kind of card. You will have essentially graduated from a four-year training course in cartomancy. You can be a professional reader while you are committed to this program. If you are not already reading cards for people, you can expect to start reading on a semi-professional or free / trade basis with friends at about the 25-reading mark and to take paying clients at about the 50-reading mark, thus using your income from readings to fund your "schooling." I went through this training myself and was reading professionally around reading number 50. By reading number 100, i had seen a vast improvement in my understanding, not only of the cards and of divination, but also in how clients approach readers and why -- and what kind of a reader i personally wanted to be. Finally, all people contemplating a career -- or already engaged in a career -- as professional fortune tellers should own and learn from the best book on the subject, "The Fortune Teller's Guide to Success" by Valentina Burton. She is a member of AIRR and is located in Dallas Texas, and she regularly attends (and reads at) the Hoodoo Heritage Festivals in Forestville, as well as at BATS, the Bay Area Tarot Symposium. The book is available through her, via Lulu, and we proudly carry it in our Lucky Mojo Curio Co. shop as well. There is no specific tarot card for the evil eye, to my knowledge, but if the question is asked, there are a number of cards that indicate general curses or general envy and jealousy (which is the leading cause of the evil eye). The Devil is the foremost among the curse cards. The 7 of Wands indicates (among other things) that you may be facing an attack from jealous or competitive people "below" you. This is not an evil eye card in and of itself, but if it comes out in a spread on the question of the evil eye, it is co-diagnostic. The 2 of Swords and the 7 of Swords (in both of which there are blindfolded figures) can be co-diagnostic of evil eye or unclarity situations, depending on the other cards in the spread. There is no specific tarot card for money crossings, to my knowledge, but if the question is asked, any of the bound or crossed cards, such as the 2 of Swords or 7 of Swords would, in conjunction with a negative coin card, such as the 6 of Coins or the 4 of Coins, be co-diagnostic of a money curse, money binding, or money block. There is no specific tarot card for ancestor contact, to my knowledge, but if the question is asked, several of the trumps will indicate the type of ancestor being contacted (High Priestess, Empress, Emperor, Hierophant, etc.) and the 10 of Coins also carries a "generational" co-diagnosis. catherine, thank you so much for recommending my book. I can not agree with your advice more; the practical, common, honest, endeavor to gain knowledge always trumps "personal gnosis". In A Deck of Spells I have also given several different sets of traditional american meanings and layouts for individual playing cards as well as combinations of playing cards that might be useful for just such a situation as discussed above. I had a reading (4 card tarot) with an AIRR member just a little over a month ago, and I hope my question isn't silly but when it comes to the near future & future card is there a time frame for either of those positions in a spread? For example: would you consider near future a couple weeks down the road? And same question for the future/outcome position...months or longer? One other inquiry. How long should you wait between readings? Thanks for any explanations! Just trying to understand what specific positions means. I had a very good reading so I'm just a bit anxious to see it unfold. I am so sorry but there's no way we can tell you this because each reader interprets differently. You would have to ask your reader. If it's about the exact same thing, wait awhile or else you're showing doubt (unless you completely disagree or something new has come up). I know that tarot interpretations aren't given on the forums anymore, but I've had the Two of Cups cropping up a lot lately... Once in my last reading, once it popped up online as the "Card of the Day" on a Tarot page I follow, and I like to pull a daily card to meditate on throughout the day, and even with heavy shuffling, it came up again. I understand that it is a wish card symbolizing the fruition of relationships. I believe that with all the love work I've been doing lately (and plan on doing), this is a good thing to have crop up. Am I correct on my assumption? You could consider patterns like that to be a positive sign of your work. While shuffling my cards, I've noticed that the Three of Swords tends to be jumping out at me a lot. I interpret the card as feeling miserable while separated from a loved one, and while I don't like being separated from my target, I recognize that it has to be right now (everything happens for a reason; we all have a lesson to learn), however I wouldn't say that I'm MISERABLE. I'm wondering if it could be a message about how my target is feeling about things? I've done lots of soul searching and meditation on it, and I don't think the card is referencing me at all; and after some thought on it, I figured maybe it was referencing my target. Of course it is possible, or the card could mean general heart break or hurt, even cheating where 3 involved. I would leave the card out and then do a reading around the card asking to learn what exactly it is referring too. cards tend to speak through the use of other cards so try and see if that helps. If still stuck then I would get a quick AIRR reading to ask them to clarify the question for you. I took your suggestion, j82, and did a reading around the card. I had another friend do one for me, as well, just to clarify. My own reading was slightly unclear, but it was basically referencing things that didn't have anything to do with me at all (such as career aspirations - I'm already rather content in my aspirations, whereas he is still getting his sorted), and I took my overall reading to mean that the card was referencing him, and that he was hiding behind other reasons as to why he was unhappy or distracting himself with other things to ignore the fact that the reason he is unhappy is because we are no longer together. The second reading my friend did about it showed a much clearer timeline; it basically said it would take a while, but he would realize that things are not going as anticipated, that his false beliefs would crumble around him, and as long as I remain gentle and keep going on my bath, reconciliation is possible. I also did another reading about the overall situation after I noticed some changes, and I got The Lovers, the Six of Cups and the Sun, which I know to be a very good thing. I've recently begun reading tarot cards and was wondering about reversals. Should we do them or not? I was going to forgo the reversals but it seems to me that my tarot deck is speaking to me with reversals. I'm pretty amazed at the clarity of the cards. From the moment I laid out the first spread, I've gotten relevant answers to my questions. I would love to reach out to another AIRR member, but presently I do not have the funds to do so but I'm worried about the disparate outcomes with and without reversals. I did a reading on my reconciliation and for my reading, I got the 4 of wands in the present and 6 of wands in the outcome, both upright. I forgot the first card but it wasn't a terrible card. This to me is success, with candles. In fact, in all my layouts for me, I always win. They are like this spread. Positive, and upright and clear. In real life, my intended and I keep reaching reconciliation milestones that have left me in awe. We are progressing nicely. So I did a reading on my enemy rival. If I were to use reversals, I get an outcome that favors me, but without reversals I get the opposite. For her reading I got the queen of swords reversed in the past (she always shows up in the past and reversed in my layouts), the 6 of swords reversed in the present and the sun reversed in the future. The sun reversed worries me, I've found contrasting opinions online. She is definitely on the outs currently and I know I can knock her down. But I know she will be persistent. I get the feeling that if I really wanted to, I could really harm his dirtbag. But I am restraining myself. Any insights are sincerely appreciated. I'd say that if you feel that your Tarot deck is speaking to you through reversals and you feel like the messages are clear, I'd say go with that. Using reversals is a personal choice; some card readers put stock in them, others don't. That's up to you. Thank you Sister Jean for your prompt response. I'm going to leave the tarot cards alone for now and just be happy with my progress. The truth is everything is going well, I am just being overly cautious. So I have been taking a lot lately about how the cards reveal different types of magical work that can be done concerning your situation. I know Miss Cat and a few other people often talk about how the cards can suggest the type of work that can be done... But it would be wonderful to maybe compile a list of root work suggestion based on the cards! When I look at the minor arcana of the Tarot I see the creative process... But we also see that they relate to specific types of magic. Wands candle and fire work. Cups bathing, bottles, jars. Swords pins, needles, sewing, engraving. Coins mojo hand, charms, stones, seals. I'm sure there is more that can be added to the list. I am even more interested in the Major Aracana suggesting magical work.. For example when I see the Temperance I immediately notice that the angel dips a toe in the body of water. To me this indicates angelic aid, cleansing and purification come by any of spiritual cleansing. But even more curious is the path in the background that runs through some rough terrain, but leads to a burning crown... Or what I call the Crown of Success. So when I see this card I know that cleansing and crown of success work might be beneficial. Another might be the Magician who is shown with red and white flowers indicating purity and passion. But also he has a representation of each element before him which clearly indicates that work should be done either with each type of magic to make it very thorough or with creative Liberty as to how you would like to work. This could go on and on... And would depend on the reading and situation. But it would be fun to have some rough ideas! I read an earlier post on this thread about using the tarot to determine what course of action to take. So I shuffled the deck and drew 3 cards. While shuffling multiple times I asked the question "if I do a (type of spell) on (target's name) using (candle color, condition oil, etc. ), what will happen?" I won't say which cards I drew up because I know this forum is not meant for interpreting spreads, but the second card (present) was a very bad card and the third card (future) was a very good card. Did I go about this the right way? Any other suggestions would be appreciated. Everybody's cards mean different things to each reader. Lucky Mojo does sell book on reading the Tarot. I do not think you will get general agreement from all readers on this question. In fact, not all readers will even engage in a "past, present, and future" reading. I personally look at the tarot as a sort of weather report, with short and long term probabilities, more accurate the shorter the length of time being looked at. So for instance if i wanted to attract true love i would use the lovers card and put it where my honey jar is, or say if it was to do harm i would use the death card to curse or end a relationship etc. The idea came in mind when i was listening to the blog talk radio from a few years ago with Professor Porterfield ( i hope i got that right, sorry in advance if i mentioned the wrong name). If someone were to make their own tarot deck with their own imagry they felt fitting per each card, do you think they could use the deck spiritually? Or do you think it's something that has to be from old art that's already set and symbolically agreed upon over generations? Shutter, people draw and publish new tarot decks all the time. I think I've over did it on my readings. I've been studying the cards and recently discovered that my cards are speaking to me very clearly, too clearly in fact. It's addicting, especially when you're eager about an outcome. Can we change the outcome of a reading by reading too much? Is there any sort bath or cleansing that can be done on myself and the cards? I was way too emotional and read way too much this weekend. I need to reset from this and bring back all the good energy that I had from a reading two weeks ago. Too many readings on the same subject will confuse the issue. Hi everyone, we are about to buy a house which we really like, and i did a tarot reading(well readings..) on the energy surrounding this house, but keep getting mixed signals. i know this forum is not about consultations; so wanted to ask for your help in a) why do you think tarot might give mixed signals - maybe i did a few readings when i shouldn't have, but one was extremely negative followed by an extremely negative one which prompted me... b) what would you recommend - shall i cleanse the deck? maybe a psychic power spell beforehand? any tips on mojo products and to make more effective readings? thank you! Thank you Sister Jean - a third party read sounds like a good idea, will try out the links you've sent. Will spells be effective in changing the predictions of a tarot reading? how often can you check the progress of your work with a reading? Yes, spells will change the outcome of a reading. Let us now if you find them! Thank you Miss. Aida I will definitely pay attention to where they are... hopefully I find them soon. I hope I'm posting this on the correct thread, im hoping to take a drive to the luckymojo store and buy all my products (it's 4hrs away) is there usually someone there I can do a reading with? I can't wait! I've been wanting to go since forever but never gave someone to go with me, I don't like to travel alone, but I'm just gonna do it, I'm low on alot of my oils. Please call the shop because you may have to make an appointment. Yes, there are readers there but just not sure if you need an appointment or not. Have fun shopping!! And have a safe drive. Wow! Thanks for posting that Miss Cat. I use the Thoth deck and found that fascinating! I am reading Lon Milos book on the deck and this will be really interesting to include in my studies. Thanks again! Without knowing your full situation it's hard for me to decipher your tarot card draw. I think your intuition on the card meaning sounds on the money though. So I will keep at it. And await for the longed aha moment. Thank you for your guidance!! For anyone that has experience with tarot reading. out of curiosity my mother went to a reader to read an old love of mines that broke my heart and my mother wanted to see how he’s doing in his personal life if he still thinks of me. The readers used tarot cards and seas shells to look for him with his full name and date of birth and the weirdest thing happened? They couldn’t read him or find him? What does this mean when the person isn’t readable or findable through any sort of physic reading??? Also this old love of mines does go to see rootworkers for protection and success in his career. Thank you for the suggestion Sister Jean, I went to 3 other readers and believe it or not even they couldn't read him. We all began questioning if maybe he placed a sort of protection spell on himself so his enemies won't be able to read him and interfere with his career and personal life. Whenever the readers tried to read him what appears is the life of his biggest enemy and rival instead. They told me they never experience not being able to read someone as if they don't want to be found by anyone through tarot, seashell, or any psychic readings. That is strange then. Maybe you're right, perhaps he's protected well enough that readers can't read on him. I'm not sure, sorry! Looking for some tips and advice. I was seeking some sweetening work for my current boyfriend however I wanna be sure that this is the right work to pursue. Anyone ever ask the cards before pursuing rootwork? Yes, many of us use card divination not only to determine if a certain type of spell is the "the right work to pursue" but also to determine what form of rootwork is indicated. For instance, cards with cups (or hearts in a playing card deck) would indicate floor washes, baths, and teas, while wand (or clubs) might indicate burning candles or fire as a portion of the job. Madame Nadia once taught a great workshop on this at the Hoodoo Heritage Festival, and Charles Porterfield alluded to the use of tarot in spell-craft in his book "A Deck of Spells." It is very common to get a reading on a situation and the reader to ask what spellwork to do for this case if any? I have been read by many AIRR workers and Miss Cat and all have asked that question and given spellwork advise based on the cards. 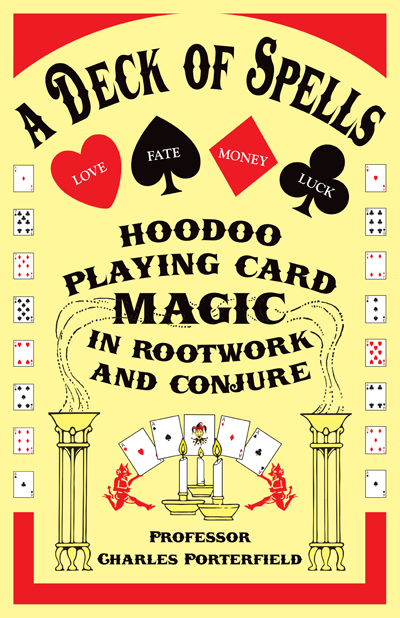 A deck of spells is a great book if interested in using playing cards and Tarot cards in hoodoo. The Toolkit LM sells also has print out of Tarot cards you can use as petition papers or glue to glass candles. Such as lovers card, write your petition on it and name each lover with name on the candle then burn the candle with it attached. I have a question about tarot. I read that one must use a different deck when reading for others, different from one’s use to read for themselves. What if one wants to read about their POI but the POI isn’t physically present? Meaning that the POI didn’t ask the question. Do we need to use different deck for that? Sorry if I’m not making sense with the question. Thank you. Your question makes perfect sense! Personally, I use one tarot deck for all purposes. I have even let other readers that I trust use my deck to read for me. I look at my cards as a tool, and I’m a minimalist, so I’ve never felt like I needed or wanted multiple decks. If you are more comfortable using a dedicated deck to read for yourself and a different deck to read for clients, I think that is totally fine, too! I know individuals who have many decks, even collect them, they change them per day of the week or season. I know workers who have one deck like heidiroseholton said. I think its a personal choice on how many and why you have them. Does one deck seem to answer certain types of questions better for you? Are you drawn to this deck over another? I have a tarot deck, playing cards and one set of oracle cards because, when I seen them I loved the design and had to have them. Outside of that Iv never noticed a difference if I use them for people, if I ask the question for people, or if they have to physically touch the cards for the reading. I am one of those that JayDee mentioned who collect tarot (and oracle card) decks. I do not change them every day, but I do have favorites, and I choose them based on the feeling I have at the time. For example: The "Enchanted Forest Tarot" looks like a sweet but slightly twisted anime card set, but if you know your cards, it is a straight Rider-Waite-Smith deck. In other words, it looks light-hearted and can be used in party settings because of the way the art is painted, but it contains the same levels of information as a RWS deck. Another deck in my collection, which I bought because it was mentioned online as unusual, is the Morgan Greer Tarot. It has no white borders, so the art runs into the edges of the cards, and the style is what I would call "vintage psychedelic" or "pop art." It is like a Rider-Waite-Smith deck, but much brighter and more extreme. All good things come in threes, and another deck from my collection that I like to use is the Tarot of the Witches. It is weird-looking and surrealistic, with bright colors and distorted figures. It was created for an old James Bond movie and was meant to be shocking, which it definitely is, at that. One last deck I use seasonally. That is the Halloween Tarot. It has cute pumpkins and black cats on it. I only use it in the month of October. It is another Rider-Waite-Smith type set, but very cute and different in terms of the Halloween artwork. My collection is small, as far as they go. I have about 20 decks. I know people who have more than 100. Can you frustrate Spirit if you ask in different ways the same question, so that what was a yes, becomes a no. I asked a yes/no question. Because I received two Tarot readings, one from the hoodoo tradition, and the other, I don't quite recall the exact name of his tradition, but it was more closely aligned to the traditions of Haiti. Both answers to my yes or no question from these two different sources was a strong yes. The hoodooist drew, of their three cards, the Ace of Pentacles--and something in my memory suspectfully remembers that the first reading from the second tradition also presented the Ace of Pentacles. Excited about the prospect (not to go off topic), I used playing cards (Stacks of three) to ask the same question and got a no both times. Reading for oneself is sometimes discouraged, and I've learned that one cannot read oneself as well as they can others -- and I've already been told that a malevolent spirit will sometimes interfere with me personally gaining a truthful answer as has been the case in the past. So as my self-administered readings were with playing cards, my main point of focus was knowing if the Tarot Readings from two different practitioners that coincided, whether those were more reliable to put my faith in -- or does the potential to frustrate Spirit appear to arise here. Should I go for another Tarot reading? I'm so anxious I'm a wreck.